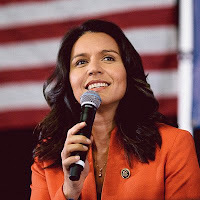 Tulsi Gabbard (D-Hawaii) is accusing CNN's Fareed Zakaria of trying to "goad" President Trump "into going to war" with Russia. "TV talking heads love trying to goad Trump into going to war w/ Russia. Here’s just one example: Fareed Zakaria is trying to get Trump to prove he's not guilty of appeasement by going to war with Russia over Venezuela," Gabbard wrote Wednesday in the below Instagram post. TV talking heads love trying to goad Trump into going to war w/ Russia. Here’s just one example: Fareed Zakaria is trying to get Trump to prove he's not guilty of appeasement by going to war with Russia over Venezuela.